Composed by Eric Thompson. Saddle-stitched, Style, Technique, Theory and Reference, Solos. Grossman Audio. Bluegrass. Book/3-CD set. 32 pages. Grossman's Guitar Workshop #20505BCD. Published by Grossman's Guitar Workshop (MB.20505BCD). ISBN 9780786671137. 8.75 x 11.75 inches. 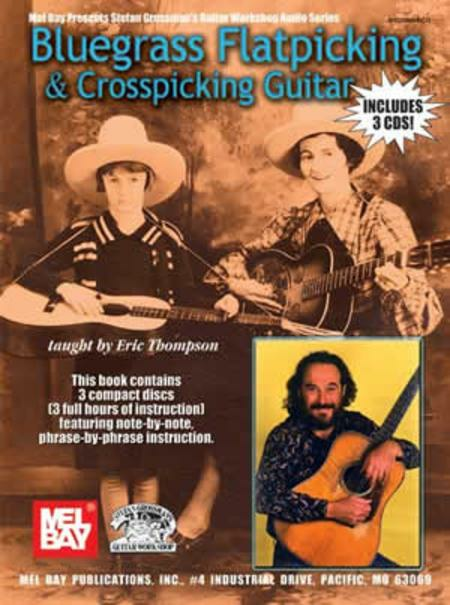 Eric Thompson teaches the exciting art of crosspicking, which is an exhilarating flatpicking technique that is an essential part of every bluegrass guitarist's arsenal. Utilizing repeated patterns on three-string groups, crosspicking captures the bounce of a fiddler's double shuffle and the drive of three-finger banjo Scruggs-style rolls. Eric instructs you on three full hours of note-by-note, phrase-by-phrase instruction contained on the three companion CDs. The 32-page book contains 12 songs taught in three easy to understand lessons. Eric will help you hone your crosspicking technique in no time 'flat'! 28 of 67 people found this review helpful.